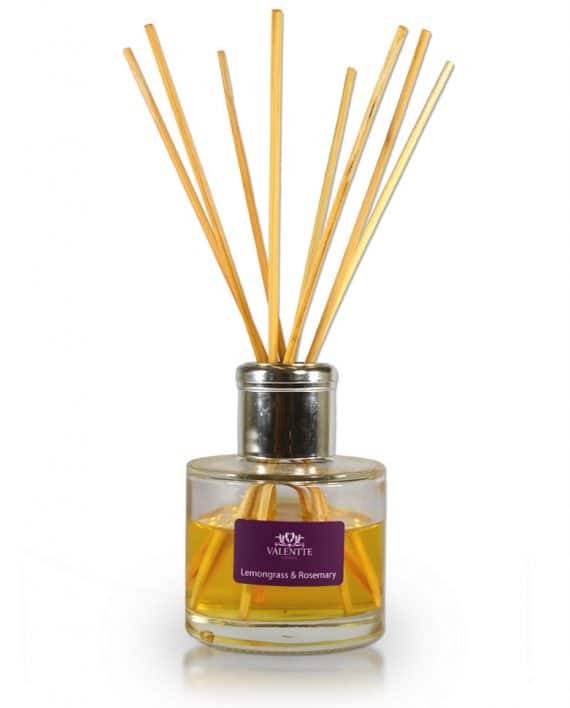 Our lemongrass and rosemary reed diffuser is made from pure, natural ingredients and will scent your home for a minimum of 4 months with a stimulating and uplifting aroma. We purchased the Lemon Grass and Rosemary diffuser at the Royal Welsh show 2017, we were that impressed we went and hunted the stall down again in 2018, it fills the room with an incredible fragrance, so pleasant we love it. As with the candle (same scent), this reed diffuser is worth every penny. I have never, ever had such a potent and wonderful smelling diffuser. It fills the whole room and is so fresh and invigorating. Will be coming back for more! I discovered this reed diffuser at Hampton Court Flower Show and absolutely love it! In fact I ordered several items which were delivered promptly after the show and the fragrance had permeated the packaging - wonderful. A lovely fresh smell and they last for months, excellent buy. My favourite. Recently opened and placed it the guest room. I love going in there for the fresh herbal scent. This smells amazing! The fragrance lasts for ages and isn’t overpowering. Excellent value. Beautiful fragrance and very long lasting – love it! Beautiful fragrance, fresh and clean. Lasts for ages if you keep changing the reeds round. Really pleased with this. My favourite way if scenting my home. They last for ages and people always comment when they visit. Have recommended to all my friends and the gift boxes are always a welcome gift. Beautiful smell and lasts a long time too! Lovely smell and the product does last a long time too! Absolutely love the smell and it lasts a lot longer than other diffusers I have used. Wont use any other product now as nothing comes close to the gorgeous fragrances and the amount of time they last. As with the other reviewers lovely smell and it does last and last. One minor point with my last order I noticed that the liquid was less than the one I had before. Please keep the liquid levels the same. Oh I love this fragrance so much. Up to now, this is my favourite. Bought with the ‘boxed’ set, 3 items for £25 – excellent value. The diffusers last for such a long time. Purchased my first in July 2017 (at Carfest North) and it is still going. Gorgeous, natural fragrance that just lasts and lasts. The packaging is rather lovely too. This diffuser is amazing, it’s lasts for such a long time and the fragrance is still going strong. I wouldn’t buy another brand now. As usual I find Valentte products excellent. My neighbours always comment about the beautiful, subtle aromas of my house. Also my friends have loved their gifts from your ranges. Hopefully they are purchasing direct from you now. Gorgeous fragrance that is lovely and fresh whilst not being overpowering. I bought two of these with a room spray as part of the gift set which was very reasonably priced. The gift sets will make fabulous presents and I will definitely purchase more for myself as well as for gifts. The most gorgeous scent; not at all cloying or artificial like so many other types. I bought mine before Christmas and, at the end of May, it is still only about half gone. Excellent value. Geranium and Ylang Ylang – an absolutely divine mix that fills the room with a beautiful fragrance – I have used this for a few years now and fallen completely in love with the smell so much that I choose this as a gift for friends and family and now they too are hooked! Gorgeous scent – every time I walk into the room, I ssy it to myself. Bought as part of a gift set – great value and a real treat. A beautiful, refreshing natural scent that I never tire of. This is my third Valentte diffuser and I am so impressed with the quality. Met you at Harrogate Flower Show. I bought the lemongrass and rosemary diffuser and it is just lovely. The fragrance is really good and is obviously long lasting. Last year I bought some hand cream in white neroli and lemon – Just luxurious! Will be certain to buy again. This is my favourite scent – a wonderful fresh yet warm citrus. I’m a reed diffuser girl rather than candles and these just last so long – fabulous value and look great too. This is so lovely. Our bathroom smells wonderful and everyone comments how gorgeous the fragrance is. Comes beatifically packaged so makes a wonderful gift as well. I am really pleased I discovered your stand and bought reed diffuser at Malvern show last year, along with hand cream, it is an amazing smell the quality is fantastic. Your products are far better than some of the expensive high street brands, you still have quality at fraction of the price. Welldone, will purchase more. As I walk into the house I can small the lovely smell from the diffuser in the kitchen. It fills the house and the diffuser lasts for a really long time. Love it!! I first bought your reed diffusers at Chatsworth Country Fayre. They smell beautiful and other friends have asked about them. I now buy them and the room fresheners for myself and as presents. They are ALWAYS greatly appreciated. Hard to choose between the different fragrances – they are all so nice. Absolutely gorgeous scent fills the room and last for ages. New favourite brand! I love this fragrance, it leaves a really natural, fresh scent though the house and the diffusers really do last! I only change mine about every six months. Gorgeous and good value. A refreshing and delicate fragrance , I have several Reed diffusers placed these around the house. Purchased a gift box at the Summer Homes and Garden Fair at Ripley. The salesman made me laugh and the beautiful smell of the Lemongrass and Rosemary made me smile. Reminded me of Lemon Verbena from Avon that I was bought as a child and the smell just makes me happy! A very pleasant experience all round! This reed diffuser smells divine. I think I might be addicted! This is definitely the best diffuser I have ever used. Absolutely gorgeous scent fill the whole room. Everyone that has visited has commented on the beautiful fresh scent. Hi recently purchased a gift box of your lemongrass and rosemary diffuser and candle set. I am normally a jo Malone fan but I have to say having used the products that I much prefer your. the scent is fresh and my home smells wonderful. will definitely be buying more. Love this product the fragrance is lovely and fresh. Really good buy. Love the smell and is lasting very well, this one has been going for three months and is less than half gone. Great value for money especially if you buy the gift box. Fantastic product- my flat smells amazing. Well worth the trip back to buy it. Bought gift box of your lemongrass and rosemary diffuser and love both. A lovely fresh fragrance that fills the room but is not overpowering or cloying. Definitely recommended! First bought this at a Christmas Show last year & absolutely LOVE LOVE LOVE the fragrance , lasts for ages & everyone who comes to visit always asks what it is , have continued to buy again & again as nothing beats this for scent , DEVINE ! This is the nicest diffuser I have ever bought, beautiful fresh scent have had several compliments from visitors ? I purchased the Lemongrass and Rosemary reed diffuser at a show in London and then went on to buy a couple of your mix and match boxes too. The smell is just so unique, refreshing and not overpowering at all. I even have one on my work desk.. its that good! It might be a current pregnancy craze but I’m sure I’ll be purchasing more when I run out. I bought this from the Good Food summer show at the NEC to put in my new caravan. My friends have been to stay and messaged me to say they need one because it smell so beautiful – I ordered the mix and match set for them. Delivery was quick and well packaged. Everyone who comes in loves this scent. A great diffuser. Have already recommended to friends. This scent is amazing, it is refreshing and relaxing, reminding me of a Thai spa. I have now ordered 2 gift sets for presents and will be recommending this to my company who use another high end brand in our offices. This is way better and a really good price. We love this item the sent is crisp & clean. Also the sent holds in any room it’s used unlike other company’s we have purchased. First bought at Hampton Court flower show. I’ve had some many comments about the wonderful fragrance in my home. Definetly on my list for Birthday and Christmas gifts! I discovered this reed diffuser at Hampton Court Flower Show and absolutely love it! In fact I ordered several items which were delivered promptly after the show and the fragrance had permeated the packaging – wonderful. My lemongrass reed diffuser has lasted well over a year and smells just as strong and fresh as the day I bought it. Far exceeds other well known brands of diffusers. I bought a set for £25 at Burghley 2017 and the diffuser is still going. I like it so much I bought 2 yesterday, also for £25 and received a small room spray (ideal for travelling) free. Excellent products at that price. I brough Valentte products at a Gift Fair last year and was thrilled they were back this year. This smell is amazing and last from beginning to end. I would definately recommend. Thank you Valentte! Bought my first one last month, the fragrance is just beautiful. Keep being complemented on how nice my home smells. Like the ethics of this company willbe buying again. I bought the Lemongrass & Rosemary diffuser and candles at Kingston Christmas markets last week. The room smells lovely and reminds me of a Thai spa I once visited in Phuket. Do recommend the products 10/10. Such a delightful young man selling the products too!! I bought this diffuser at Country Living Magazine Christmas Fair in Harrogate last week. It is divine! The fragance is powerful without being overwhelming and the scent is lovely. This is the best diffuser I have ever bought and I will be back for more! I received this diffuser when I bought a gift box. It really does fill the room with a lovely scent. Thank you Valentte for making such beautiful natural products.. I am a convert. And special thanks to Andy who packed my products for fantastic customer service. This is such a great long lasting fragrance! I stayed with a friend and was so impressed with the fabulous perfume coming from her Valentte diffuser I decided to order 2 gift sets for myself and as presents. Will definitely be a regular purchase from now on. Absolutely love this fragrance it is my favourite and use it both in my salon and at home. This is an amazing product smells wonderful!!! This is the best diffuser I have ever used. It was a gift from the developer when I moved into my new flat and since the day I know this product, I stopped buying other brands. Lemongrass smell like a luxury spa and whoever visited my place always give good compliments on it. Visitors over the Christmas holiday have asked what the delightful smell was and i was very happy to tell them about your products especially the lemongrass diffuser and candle. Bought this as a present along with a soy candle, they arrived beautifully packaged and the scent is amazing. Definitely a hit! Love this fragrance – it’s quite strong but not over-powering. Perfect for the bathroom. Very good value too. This reed diffuser is amazing, the lemongrass and rosemary is refreshing and the smell is beautiful and hasn’t diluted since opening it. I bought this at Ascot Christmas fair as the scent was the best of all candle suppliers there! Amazing smell. Had so many compliments. Long lasting fragrance. Highly recommend this. Have had diffusers from other companies but this company produce amazing products. All my family are now using them. A lovely fresh fragrance… I now have them in 3 rooms around the house. No other diffuser lasts as long… I just love it!!! Excellent service and very speedy delivery. This is the second time I have purchased these diffusers. The first one, purchased at the Malvern Spring Flower Show lasted over twelve months and it is still going strong. Other makes evaporate so quickly. I have just purchased the Lemongrass and Rosemary as well as the Verbena and Peppermint Diffusers. They were beautifully packed in a presentation box, tissue paper and ribbon. Well done, Valentte! Smells lovely. Even husband with super sensitive nose commented on it …. in a good way! Lovely long lasting scent. Bought in the sale – definitely worth it. I love this fragrance. It’s fresh and zingy, and powerful. I’ve used many brands of diffuser and the vast majority of them just do not put any fragrance into the room. This is so powerful I’ve taken some of the reeds out of the one in our bathroom! I love it. I stocked up in the sale and would thoroughly recommend. I’ve even put one in the teenager’s room to great effect. I first came across Valentte in Chichester at a market and bought a three pack of their products as they smelled gorgeous and were reasonably priced. Nothing I’ve come across since compares at this price point. They also make great gifts as the packaging is gorgeous. Excellent product, lovely scent which is commented on by everyone. Long lasting as well, very happy with item. I came across Valentte at a Christmas Fair last year and bought the Lemongrass reed diffuser and candle. Lovely scent – compliments received from many friends! 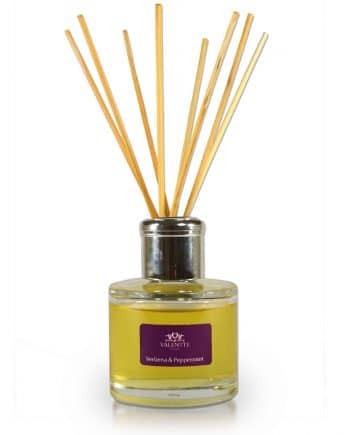 Brilliant diffuser – smells gorgeous and lasts for absolutely ages. Very refreshing smell and lasts for a good long time. Value for money. Love the smell of the diffusers and they last for so long. 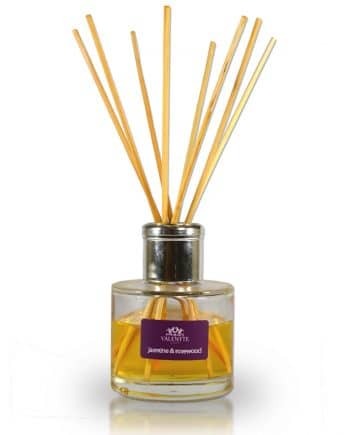 I just love these reed diffusers they smell lovely and lasts for weeks. I discovered Valentte through a friend who had a lemongrass and rosemary diffuser in her downstairs toilet – it smelt divine! Unbeknown to me, my friend had bought me the gift box with two of these diffusers in! Such a lovely gift. I’ve since bought two more sets of the gift box – such a great gift for other friends! Four of us now use Valentte on a regular basis! The lemongrass and rosemary is my favourite “ perfume” but also like the lime/grapefruit and white neroli and lemon- the products last a long time which is an added bonus! Lovely product really gorgeous smell. Only discovered Valentte at Christmas and I am hooked. Love this diffuser. My favourite smell and lasts such a long time. I absolutely love the Valentte reed diffusers-such beautiful products that fill my cottage with their gorgeous fragrances. I discovered Valentte at Badminton Horse Trials last year and have made several purchases since. Visitors always comment on the fresh scent of my lemongrass and rosemary diffuser. The very first Valentte product we bought and it remains our favourite of all the diffusers. Remarkably long-lasting and fresh with no trace of synthetic chemicals and the like. Freshens up a large living room with ease. Well worth the money and far superior to other much more expensive brands. I love love these products and everyone comments on the scent from my diffuser. Love this diffuser lovey,easy to order and prompt delivery . After trying a order of diffusers at the Great Yorkshire Show we were very impressed, we put a order in for more products just after Christmas I don’t think the service we received could be bettered. Thank you and yes we recommend your company and we do tell our friends about you. Love this fragrance. I purchased 2 recently to replace one my husband had bought as a gift at the Wisley Chrstmas market. Very long lasting. Have also bought a gift pack tovgive a friend for a special birthday. The lemongrass and rosemary diffuser is gorgeous. Such a lovely fresh perfume it scents the bungalow beautifully. Well packed and fast delivery, First class. I spent a weekend in my daughter in laws air bnb and fell in love with it then. I LOVE this candle so much! The scent is powerful without being overwhelming and it lasts a long time. Loved the tip when I first purchase on your stall at the grand designs event to burn ge candle to the edge the 1st time it’s used and it will burn equally. Absolutely love these products. They smell wonderful and last much longer than any other diffuser I’ve used. I’m a happy repeat customer. I first met them on a stand at a horse trials several years ago and now also use the mail order service. Smells amazing,lasts alot longer than other diffusers.Would deffinantly recommend. A beautiful, clean and refreshing fragrance. Will definitely buy again. The best reed diffuser I’ve ever bought! Probably my favourite of the diffusers. I love the light, natural fragrance which is strong without being overwhelming. I was cleaning a clients house and could smell this lovely aroma turns out it was the lemongrass and rosemary reed diffuser. 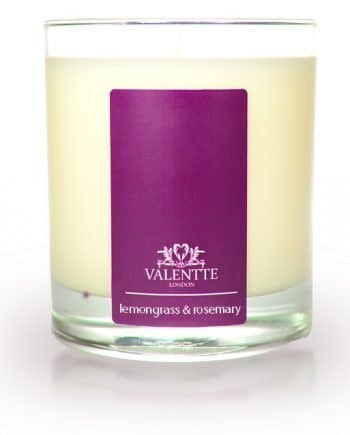 I love this smell and I cant stop buying them I have just got more for my daughters new house and have told my friends to get me more for my birthday .They come nicely packed and arrived promptly .Will be trying other products from Valentte my house smells beautiful . Love this scent which is so fresh. It lasts so long and everyone comments when they walk into my house . Love this product such a beautiful scent and really strong without being to much. Every time my dad came to my house he commented on how gorgeous the smell was in my hallway and cloakroom so I’ve just bought him two for his home he’s over the moon! Would definitely recommend this product. I had bought the Lemongrass and Rosemary room spray several times at various shows, until last year at the Countryfile show Luke convinced me to try the reed diffuser and I absolutely loved it. Since then I have discovered ordering on line and have tried several different fragrances – all good, but the Lemongrass and Rosemary remains my favourite. I only replaced it a couple of weeks ago, it lasted so long. Fresh, sharp and sweet all at once, and strong enough to scent quite a large room. I also keep a room spray in the car. Love it. Bought my first valentte diffuser March 2018 from Living North spring fair in York. Liked so much ordered 2 more (still using original diffuser so lasted approx 10 months so far)! Friend liked too so ordered 1 for herself online. Originally purchased one of these in a gift pack at Hampton Court Flower Show and have continued to be a fan ever since. I now won’t use anything else! Several friends are now fans of this reed diffuser as it smells gorgeous and lasts for months and months. A really good buy. I purchased the home fragrance box with the lemongrass diffuser more than a year ago and just fell in love with the scent. Being an Asian, I love putting lemongrass on my food, but it won’t end there now because I can smell it everyday since I started buying the diffuser. I don’t know but I just kept on stocking up and now I have like 20 or more lemongrass diffusers. I have been giving these to my friends because they, too, just love it! I also have the hand creams, hand wash and lotion, all of which are of the same scent- lemongrass and rosemary? I love the aroma of this diffuser. I first purchased the product at a Christmas show in Olympia, london. Since then I’ve bought a number of them for myself and friends. They make great gifts. I’ve had several compliments from visitors to my home asking what is that lovely smell. I’m a bit of a diffuser addict. (With a dog, two cats and a teen, you need all the help you can to purify your home.) Unlike some diffusers which quickly lose their fragrance, the Lemongrass and Rosemary is still glorious a couple of months in. Even the (very) expensive diffusers on the market don’t seem to keep their fragrance so long. Or smell so completely and utterly glorious. I’m completely in love with this fragrance. This is what heaven smells like. I was given this difuser as a gift and I love it – it has lasted many nonths. So recently I orderdd one for my daughter as a Birthday gift and she absoluelyl loves the fragrance. I shall be purchasing more in the future. Having loved the lemongrass and rosemary hand cream, I decided to try the reed diffuser. Most reed diffusers lead to migraines, but this is really fresh and has had no ill effects. Everyone who comes in loves it and I will definitely use them as presents. I first discovered Valentte fragrances at their stall at the Hampton Court Flower Show a few years ago. I instantly fell in love with the lemongrass and rosemary scent and purchased a diffuser. It lasted for ages and every day I was so glad I’d bought it! I’ve recently bought another one as I find that other brands don’t hold their scent so long and don’t smell as good! Absolutely adore this fragrance! I get so many comments about it when anyone visits! I’ll probably never use any other diffuser. First founf Valentte at a Christmas fair at Burghley House and have purchased every year for myself and as gifts. Although more expensive than some Reed diffusers they are well with the money as the fragrance is lovely and they last for ages. I bought this as part of a box set when I visited the Ideal Home Show in London. I am very sceptical of Reed infusers as I have found in the past that they are very disappointing for using in my lounge. Until now – this infuser has made my whole lounge and hallway absolutely wonderful. I will definitely being using more of these products and will order the different scents as well. Long lasting smellie! Absolutely gorgeous and so many positive comments from visitors. Absolutely my favourite fragrance. Everyone comments on the aroma and it permeates the whole house. Great value too. Highly recommended. I’ll definitely be purchasing again. Love these fragrances! Valentte have the best fragrances ever! I’ve bought them for so many gifts and treated myself too! Definitely my favourite product! I have these diffusers in several rooms and they continue to emit a beautiful fragrance long after similar products have expired. The fragrance is fresh and natural which is brilliant as I can’t abide the smell of commercial synthetic room fresheners. I can recommend without any hesitation! The smell wafts across the room as you walk in. It invigorates you but in a calming manner. It last a long time. If you put by a window & open it slightly after changing bed linen the smell wafts over the fresh bedding & ladys. What a refreshing perfume ,have placed it in the hallway so it wafts throut the house…..simply glorious. I am now totally hooked on Valentte diffusers. I have to have the next one ready for when the one in use is running out! The Lemongrass and Rosemary is my ultimate favourite! I have bought Valentte as gifts too and have always been complimented on how gorgeous they are. I am now a customer for life! I have been so disappointed in the past with diffusers including expensive ones. Having discovered Valentte Lemongrass and Rosemary Diffusers at the Homes and Garden Fair, Ripley Castle, I will not be buying diffusers from anywhere other than Valentte from now on. Firstly the smell is divine, fresh and uplifting and it lasts. Day after day I walk into the room and can smell the gorgeous aroma. Occasionally I turn the reeds for an extra hit. The gift boxes are great value, lovely packaging and I have purchased several as gifts. It is important for me to know they are natural and organic products. Excellent day-long fragrance – beautiful scent. This is a lovely smelling diffuser and it lasts such a long time, I bought this in a gift box which are such good value, to replace one I had I first found out about Valentine at Tatton flower show and would highly recommend. Simply gorgeous, this is superior in quality and smells beautiful. Not only is the fragrance strong enough for our large bedroom, I can also smell it downstairs. I wouldn’t hesitate to buy again. Not only refreshing but beautifully relaxing, also bought hand cream which is so soft to use but gives a long lasting scent. The gift boxes will make a wonderful present, looking to choose fragrances for my daughters wedding so I will be trying different products from the range too. Whole room smells lovely! A really nice smell, unlike other diffusers that can smell chemically this is really natural. Love it. This arrived as a free gift. My problem was it looked so good do I keep it or give it as a present. The smell is divine and it looks so good. So I’ll keep this one and buy one as a gift. It is an absolute pleasure to write a review for this gorgeous diffuser. The scent is beautiful and fills our sitting room, in fact, you could almost say that I am addicted to this fragrance. I will not hesitate to buy it again. I love this diffuser! I was given one as part of a gift set a few years ago and have never been able to find any others as good! The lemongrass smell is just so lovely and fresh! The box it arrived in was so pretty too! I would 100% recommend and i will definitely be re-ordering again! Already planning to purchase more! The smell is heavenly and I am completely thrilled with my purchase! I’m so happy with my purchase. House smells amazing when you walk in and everyone comments about the heavenly smell. The lemongrass is so fresh I’m addicted !! This is such an amazing reed diffuser and I now don’t purchase from anywhere else. The smell is simply amazing and it just makes the house smell so fresh and lovely. Everyone comments when they come into our house what a lovely smell it is. Would highly recommend this product. I was lucky enough to receive this diffuser for free as part of a recent promotion, but I’ll absolutely be buying more myself in the future! I can see why this fragrance is popular – it’s so fresh and makes you smile! The whole product is lovely quality, looks great, and fills the whole room with fragrance. Thanks Valentte! I fortunately came across the brand at the Ideal Home Show and tried the hand cream, walking around with it on. An hour later I could still smell the fragrance so bought a gift box of products. I’ve been using the lemongrass and rosemary reed diffuser in the bathroom for almost three weeks and the fragrance is still clear and very little has ‘evaporated’ from the bottle. I’m very happy with the purchase, I’d recommend and will use again! I discovered Valentte at the Harrogate Country Living Fair last year. Loved the smell of this diffuser and have ordered it online since. Valentte reed diffusers last so much longer than any others I have tried and the fragrance is delightful. The best fragrance ever. Really uplifting when I come into the house. Am I the only one who can smell notes of ginger? Diffuse, burn or spray, but definately buy this one! Beautiful fragrance and makes the house smell lovely. Will definitely be ordering another one.